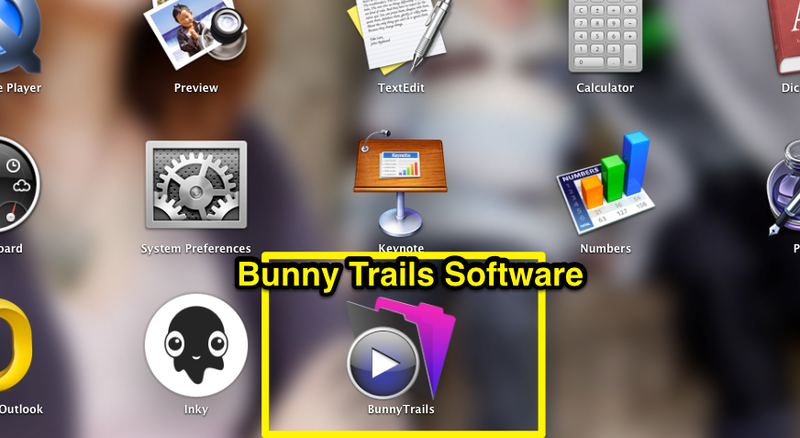 Bunny Trails Software is compatible with Mac OS X 10.11 and greater. Before starting the download and installation process on a Mac, be sure your "Security & Privacy" settings in the System Preferences are set to allow you to download software from a source other than Apple's App Store. The following section will guide you through the process to prepare your Mac for the Bunny Trails installation. The steps are simple and should take less than a minute to complete. Using a Mac? Start Here! Before installing Bunny Trails, be sure to visit the "Security & Privacy" settings to ensure a smooth installation. To begin, locate the "System Preferences" icon on your Mac's Dock. Click this icon to bring up the Systems Preferences window. 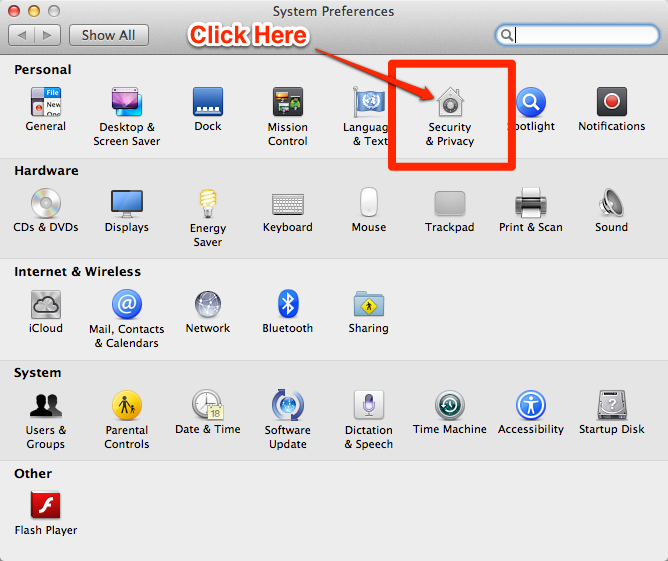 Once the System Preferences window is open, click the "Security & Privacy" icon (pictured in RED box below). In order to make any changes in the Security & Privacy area, you must first "unlock" this window. 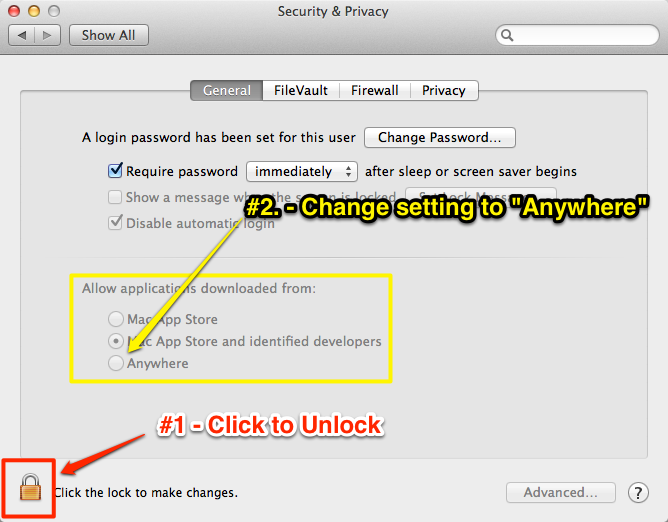 #2 - Change the "Allow applications downloaded from" setting to "Anywhere." 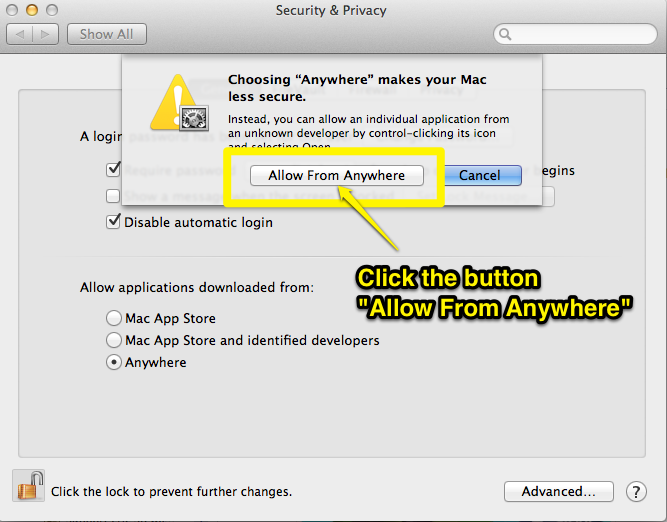 When you change this setting to "Anywhere" a dialog box will open. Be sure to click on the "Allow From Anywhere" button. You're ready to install your copy of Bunny Trails Software! Please Note: After you install Bunny Trails, you may come back to this section and return your settings to the factory settings. - "Mac App Store and Identified Developers." 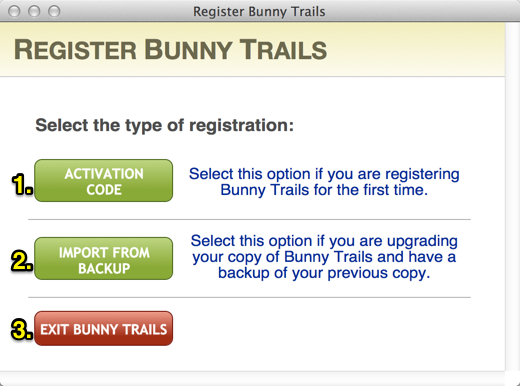 Once you successfully purchase Bunny Trails, you will be sent an email with directions for downloading the program. Once the program is downloaded on your Mac, you will need to locate it. Most Macs are defaulted to download to the "Downloads" folder or to the desktop. Click on the file entitled "BunnyTrails_v2_0_Mac.dmg." This action will begin the installation process. After a few seconds, the installer window will open (pictured below). Drag the Bunny Trails icon (lounging bunny) to the "Application alias" folder and release it (drag and drop). 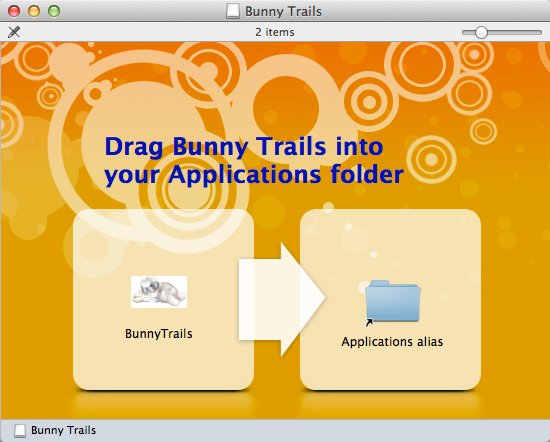 Within a minute or so, Bunny Trails will be copied to your Applications folder. The installation process is COMPLETE! A pretty simple process! Launchpad - One way to locate Bunny Trails is opening up your Launchpad. Click on the Launchpad icon located in your Mac's dock (picture above). Then, click on the Bunny Trails icon once the Launchpad opens (pictured to the right) . 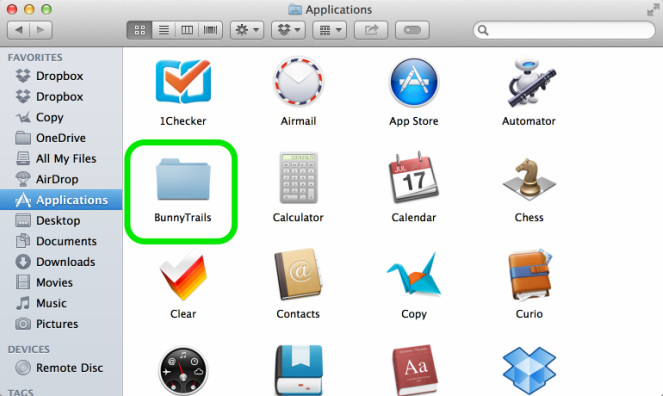 Application Folder in the Finder - The other way to locate Bunny Trails is by opening up your finder window and accessing the Applications folder (pictured below). 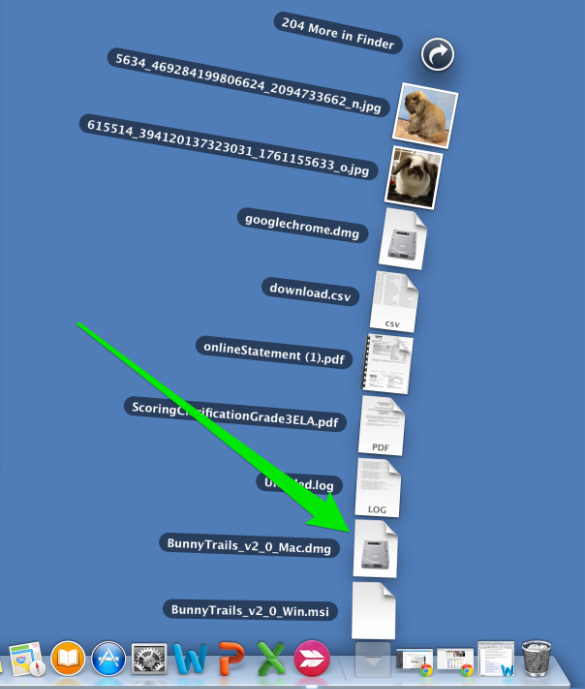 Double-click on the Bunny Trails folder icon to open its contents. Pictured below are the contents of the Bunny Trails folder. 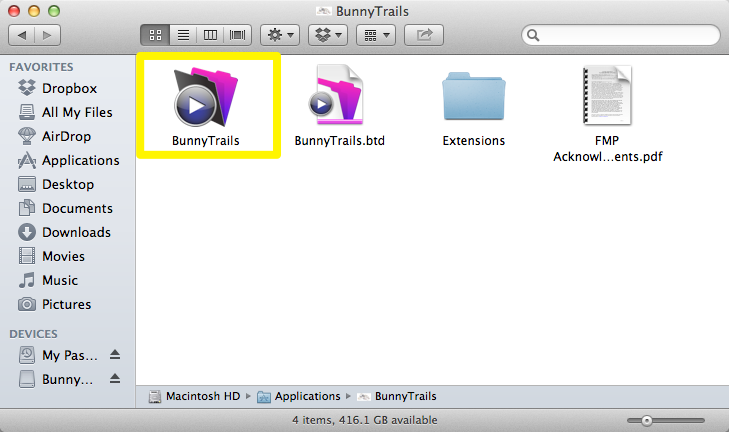 Double-click on the Bunny Trails application icon located in the yellow box (below). After double-clicking on the Bunny Trails application icon (above), you may see the window pictured below. Simply click on the "Open" button. Once this action is complete, Bunny Trails will open so that you can begin the short registration process. Follow the directions below to register your copy of Bunny Trails. 1. Enter the Activation code that was emailed to you. 2. Select this button if you are upgrading your Bunny Trails and have a back-up of your previous copy. 3. Select this button if you wish to exit Bunny Trails without activating it.